One of the most difficult parts of doing any sort of independent project, writing or otherwise, is managing all of the kids’ topics and ideas. But what’s even more difficult is getting them to even come up with topics. Here are some great ways to have kids generate ideas and resources where they can go if they’re looking for ideas for writing. Pose a question or simply create a board meant for asking questions. These give kids a place to go if they’re wondering what to write about. This also gives kids models of what other students’ ideas might look like. A lot of the time, they don’t realize that they actually have good ideas until they see some of the ones their peers create. I do this all the time to give the kids a base of ideas and also for comparing ideas. 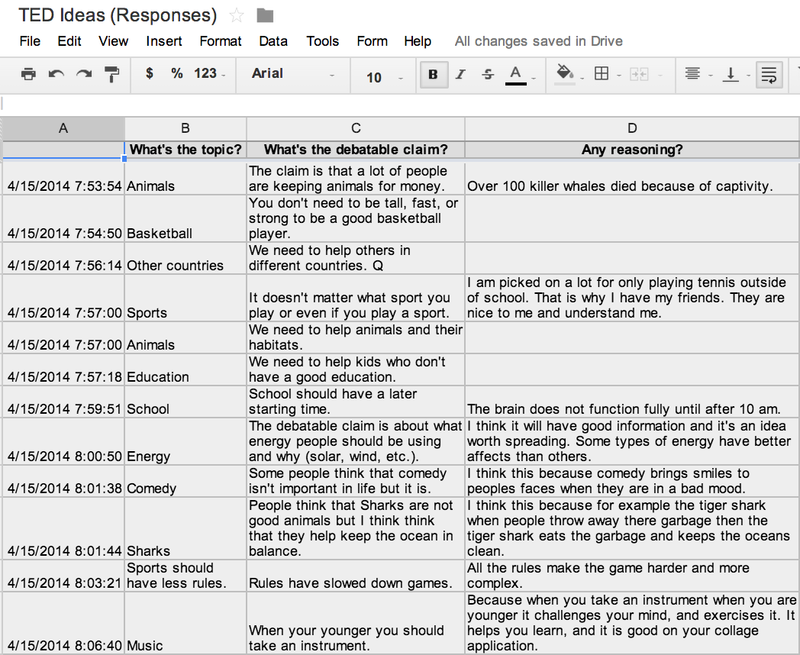 In this Google Form, my students and I were looking at the “remarkability” of TED ideas, as the mantra for TED is “ideas worth spreading.” Allowing students to compare different ideas and actually assess this remarkability not only provided examples of strong ideas, but it also allowed students to develop their own subjective understanding of the difference between a “remarkable” idea and an “unremarkable” one. Google forms are also great for keeping track of your one-on-one conferences. In these conferences, should you see a child is really struggling with generating some ideas, you can brainstorm with them and record your collective ideas in the Google Form for them to refer to at any time. I’ve also sent the conference log form home before, encouraging students to generate ideas with their parents. The parents love it, and it helps to strengthen the partnership between school and home. Making a web of possible ideas in the Popplet app could be especially helpful when generating ideas. This app also has the potential for students to draw lines between “popples,” allowing them to make connections between ideas and possibly even fuse multiple ideas into one. Last week, I had a student who contemplated doing his entire TED talk on using collaborative tables in classrooms and why kids should chew gum in school. By using Popplet, I was able to show him how these ideas were connected through “ideas about progressive education,” allowing him to continue adding to his map ideas about what he would like to see for schools in the future. I really hope that gum idea doesn’t catch on. 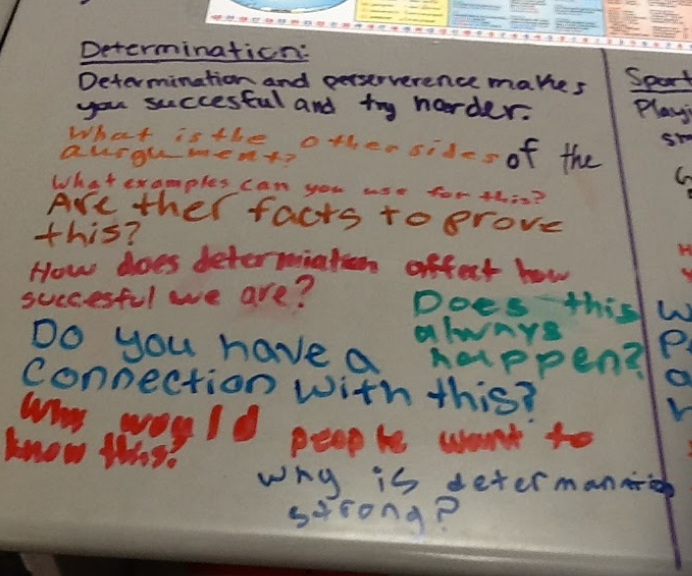 Note these critical questions on one student’s topic of “determination.” This helped her to narrow down and focus her idea. These are especially fun, as students are able to actually begin engaging critical thinking skills. In my classroom, I had students write their topics and/or claims for TED talks on their desks with Expo Markers. I know what you’re thinking–YES, you can write on your desks with EXPO markers and they come off. Do me a favor and try it first with a little dot, just to make sure your desks are the same material as ours. I digress. Once they write their topic down, students can come around and ask questions about these ideas. Not only does it help students to narrow topics and claims, but it also helps others see what kinds of ideas are out there! This is a rapid-fire “game” that I made up on-the-spot one day as a warm up activity. To engage their minds and simply encourage them to spit out ideas, I asked them all to say one word that captured a passion of theirs. Some of the students automatically expanded it to a phrase, which was fine. It’s important to remember that when generating ideas, you want to welcome all variations. Students need to feel comfortable taking risks, and this “game” helps achieve it! After the first round, sometimes we’ll do a second. In any event, in one of the following rounds, I ask students to take the one-word or one-phrase idea and find something more specific within that topic about which they’d like to learn or write more. The beauty of the activity lies within its simplicity. Students are merely going around saying words with the intention of generating ideas. By the time it goes around the circle once, your students have heard over 20 different examples of ideas, helping them to begin making connections and generating their own ideas, even if they are strikingly similar to the ones they’ve heard. Trust me–there’s no copying. It’s pretty hard for two kids to do the exact same topic in the exact same way. There’s nothing worse than a rushed idea. In your plans, be sure to account for at least two weeks where students are able to generate ideas, examine mentor texts, use their peers, and participate in activities meant to help get their minds working. If it gets to the end of the two weeks and there’s still nothing (which is rare), then it might be time for some heavier intervention, like providing a list of topics to choose from.